Using the Accelerated Piano Lab, our beginning students learn 35-50 songs in their first year in a variety of genres. They progress through their books faster then the publisher recommends. Our kids are able to play Greatest Showman and Frozen tunes in just 6 months time! We use a modern game-ified piano experience that has them learning to play 4x faster then traditional methods. We record tracks, videos for YouTube, and use iPad learning software all to reengage the 21st century piano student. We make logistics effortless for parents with automated online billing, 1 click cancellations, and 1 click reschedules. The problem: Was your piano lesson experience as a kid AMAZINGLY fun? Statistics show... probably not. If you have ever had piano lessons before, the chances are high that you did not enjoy your experience. The sad truth is that most kids quit piano lessons. They never quite got hooked on piano. They often reflect on it as an unpleasant experience. Maybe you believed you were just not "born with the gift". For the longest time, piano teachers seem to teach facts. Things were overly theoretical. "I JUST WANT TO PLAY" you cried. Piano was boring and only for music composed by dead guys. The fundamentals were a snooze to get through. And don't get me started on practice... - the word still instills fear into student's hearts. Deep down they could never do enough to make their piano teacher happy. You were given new music to learn on your own and had to decode the hieroglyphics of music. You probably always felt one step behind your teacher. ​Discussing practice rarely makes anybody happy - the parent, the student, and the piano teacher included. This is why I have made it my #1 priority to create a solution for your kids to love piano lessons. The Solution: Each week, I help 50 students enjoy the rewarding study of music. I also make the entire experience convenient and pleasant for parents. My major goal is to help make the learning process FEEL easy for students, yet so addicting they can't stop playing piano. In this learning process, the kids enjoy harnessing their musical skills, and then become more confident kids as a result! ​Whether you are a complete beginner, or years into your journey, I believe learning the piano can feel EASY and you can love the music making process! 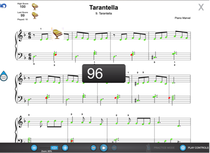 ✅Allows the student to complete their music books faster with better retention. ✅Kids learn their music in lessons so well, home practice becomes all about review - aka more fun at home. ✅Includes some amazingly fun music technology… I wish I had these engaging tools as a kid. ✅Will minimize your need to enforce practice at home. My piano experience over the past sixteen years has shown me that any student can thrive in the proper learning environment. ​The vast majority of my students develop skills faster then traditional music lessons and even address composition and improvisation which are rarely touched on - I believe the casual, yet focused culture in my school is the key to their success. If you want to claim one of the last 10 spots in my studio, I encourage you to claim your free trial lesson by clicking the button below. Fill out the contact form. From there you can see all my time slots available. Want to start making great-sounding music fast?